THIS ITEM IS NOT AVAILABLE AT PRESENT. WE WILL NOT BE GETTING ANYMORE Disney Princess Cinderella Magical Story Skirt Doll. From the Disney Princesses collection by Hasbro. 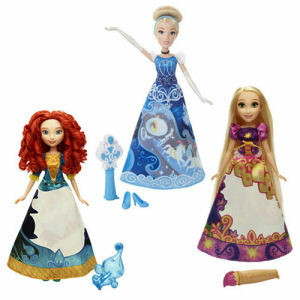 Disney Princess Cinderella Magical Story Skirt Doll. Reveal the story with the magic accessory! Measures approximately 10 inches tall. Ages 3 and up. Hasbro Disney Dolls shipping from Canada. No Surprise Border fees or Customs!